The Son of God, Jesus Christ, apart from being projected as the Catholic equivalent of the Hindu “OM”, is increasingly being depicted either as a yogi or as a dancer in the likeness of Nataraja, the “Lord of the Dance”. This is only one facet of the rampant Hinduisation of the Catholic Church in India. Jesus, the Second Person of the Blessed Trinity is not a yogi; He is the Enlightened One. A yogi is one who achieves moksha or liberation from the material world through the Hindu system of yogic meditation and attains enlightenment or self-realisation when he merges into the impersonal consciousness of the universe that some call god, and is able to declare (aham brahmasmi) that he is now a divine being in union with this god. It is blasphemous to describe Jesus as a yogi which many priests are doing, and equally blasphemous to substitute His crucified image with an idol of a dancer, Nataraja being an aspect of the Hindu deity Shiva. and also note that the crucified Jesus is being replaced with either a “resurrexifix” (the oxymoron of the risen Christ superimposed on a Cross), or by a “risen Christ” with NO cross at all on the main altars of churches. National Biblical Catechetical Liturgical Centre (NBCLC) of the Catholic Bishops’ Conference of India (CBCI) Bangalore, India. The flyer sports a yogic Jesus as well as a “resurrected Christ” in a sort of dancing pose. Fr. Christopher Coelho OFM. According to the information provided, it is supposed to illustrate “The Lord, your God, is in your midst … he will dance with songs of joy for you, as one does on a day of festival“, Zephaniah 3:17. The above picture of the “crucified Christ” without his cross is on page 140 of the Novus Ordo English Missal, Indian Edition, published by Theological Publications of India, Bangalore, 1974. Above: Yoga guru Fr. Joe Pereira of the Bombay Archdiocese at the Jnana-Deepa Vidyapeeth (Papal Seminary) where Jesus is depicted as a dancing Hindu deity overlooking the main altar. Note the “Risen Christ” image to his left. The crucifix is missing in the seminary’s chapel. Yoga guru Fr. 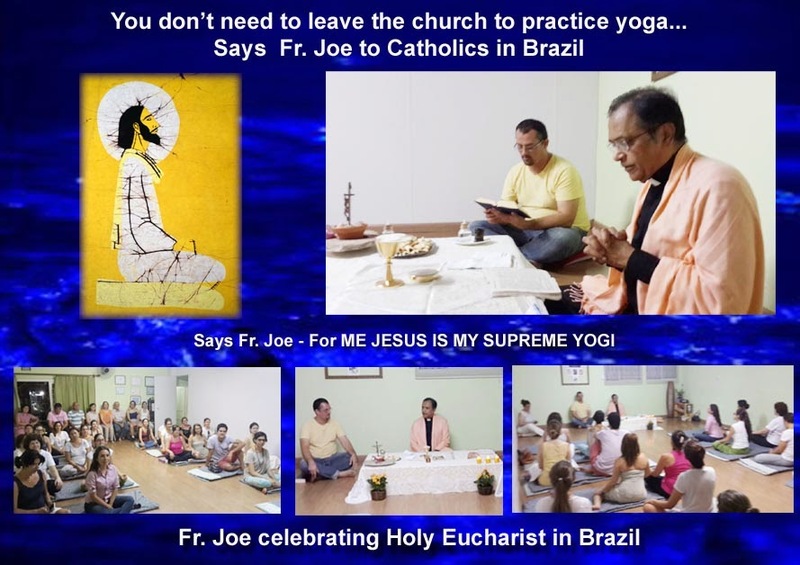 Joe Pereira put up the above image of the yogi-Jesus at his blog. 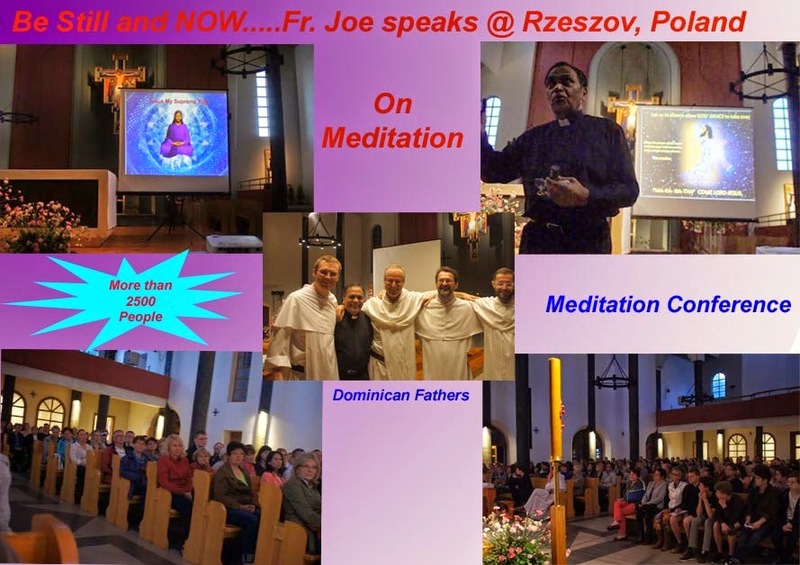 http://ephesians-511.net/docs/FR_JOE_PEREIRA_INTRODUCES_MOTHER_TERESAS_MISSIONARIES_OF_CHARITY_TO_YOGA.doc, and find the links to over 15 reports on this CBCI-endorsed and highly awarded yoga master who is a priest. Christ in a Quilon, Kerala “church” that has NO ALTAR and NO CRUCIFIX. Through the hand mudra Jesus conveys that he has achieved enlightenment. Indian Christ worshipped in Kerala temple! Eclipsing the conventional crucifix, Christ is sculpted in a sitting posture. He meditates in Abhayamudra under the shadow of a peepul tree. The church/temple named Jagat Jyoti Mandir (House of the Light of the Universe), inaugurated by Kollam bishop Stanley Roman on Friday, is supposed to be a place of exchange for religions. On Friday, the bishop celebrated the mass sitting on the floor. The structure, with a tall stone lamp in front of it, could easily be mistaken for a Hindu temple but for the cross on top of it. There isn’t even a crucifix behind what should have been the altar. Christ is represented as seated in padmasana like the Buddha under the Bodhi tree. In the Institute’s “chapel”, the “altar” is erected only for an Indian rite squatting Mass and there is no crucifix anywhere in sight. There is no provision for going on one’s knees so one must be having to squat right through the “Mass”. 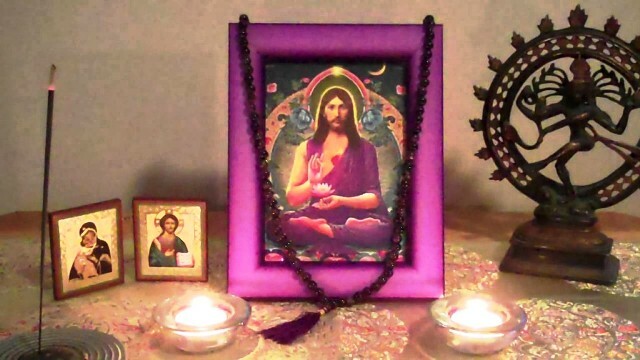 The “Indian” Jesus, but naturally, is in a meditative position. Indian, they say. I say Hindu. Or Buddhist.